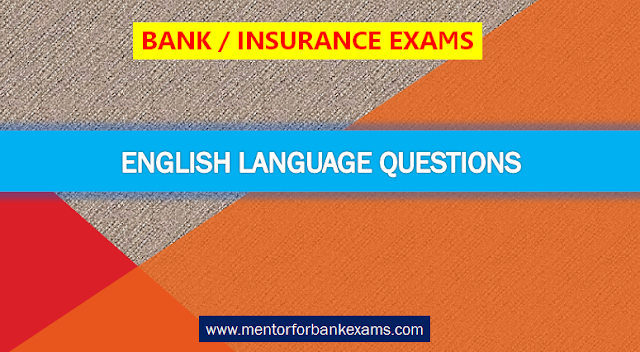 Directions (1 – 5): Read the passage given below and answer the questions that follow them. It is welcome that government has taken up the important subject of reforming political funding. But the proposal set out in the Budget, to let donors buy so-called electoral bonds that can be redeemed only in the account of political party from banks and donate them to the party of their choice, serves little purpose. Instead of advancing transparency, the bond gives legitimacy to opaque contributions to political parties, trashing the present norm that party must maintain a list of all donors who contribute any sum larger than Rs.20000. This denies citizens the right to know who funds parties. The identity of bond buyers and parties redeeming them will be known to the banks issuing them, The Reserve Bank of India and presumably the ruling government of the day. This leaves the mechanism open to abuse by incumbent parties, and wreck the market for these bonds. In a democracy, the fundamental point of campaign finance reform is to let every voter know the identities of big political funders, and their interest in doing so. Poll bonds do the exact opposite. Nor will lowering the ceiling on anonymous cash donations from Rs.20000 to Rs.2000 deter donors or parties from giving or accepting unnamed cash donations: the number of donors will simply go up 10 times. In any case, parties show only a fraction of their actual spending in the accounts they file. Identifying the source of income for this sliver of their spending is neither here nor there. The starting point of the reform we need is to get a handle on realistic spending by any party. Things might work better if the Election commission scrapped its impractical spending limit and instead, made it compulsory for each party and candidate to reveal spending at each level, starting from the polling booth. These numbers should be open to challenge by rivals, the media and watchdog bodies. The EC can then finalize actual spending and ask parties to reveal from whom all they received this money. This might still leave some political funding unaccounted, but would still mark a huge improvement over the current state of affairs. At any rate, policy should not valorize opaque political funding. 1. Which of the following steps is taken by the government to reform political funding? Refer to the first paragraph of the given passage. It talks about the proposal set out in the budget to let donors buy so-called electoral bonds that can be redeemed only in the account of political party from banks and donate them to the party of their choice, which is mentioned in option (a). Option (b) is the current norm while option (c) wrongly states the ceiling on donation to Rs. 2000 instead of Rs. 20000. Option (d) that is to make it compulsory for each party and candidate to reveal spending at each level is a suggestion given by the author in the last paragraph and is not a step taken by the government. Hence, option (a) is correct. 2. Which of these statements is/are true for the electoral bonds proposed by the Government? a) Electoral bonds allow every voter to know the identity of big political funders and their interest in doing so. b) The identity of the bond buyers will be known only to the banks issuing them. c) These bonds will be available only in the price limit of Rs. 2000/- to Rs. 20000/-. d) These bonds can be redeemed only in the account of political party of donor's choice. Refer to the first paragraph of the passage. It is mentioned that "the proposal was set out in the Budget, to let donors buy so-called electoral bonds that can be redeemed only in the account of political party from banks and donate them to the party of their choice" which is what (d) is talking about. The first sentence of the second paragraph says that "the identity of bond buyers and parties redeeming them will be known to the banks issuing them, The Reserve Bank of India and presumably the ruling government of the day"; however, option (b) only mentions 'the banks issuing the bonds' and is therefore, incorrect. The third and fourth sentences of the second paragraph talk about "the fundamental point of campaign finance reform is to let every voter know the identities of big political funders, and their interest in doing so and poll bonds doing the exact opposite"; eliminating option (a). The passage does not give any information about the price limit of these electoral bonds; therefore option (c) is incorrect. Therefore, out of the given options, only option (d) is correct. 3. According to the author, the proposed electoral bonds serve a very little purpose in reforming political funding. Which of these is the practical resort for this as suggested by the author? a) To order political parties to follow a specific spending limit in election campaigns. c) To ask parties to reveal the source of income of all the candidates along with the property details. d) To prescribe taking all the donations only in the bank account of political parties for transparency. Refer to the last paragraph of the given passage. The author suggests some measures for reforming political funding like scrapping the impractical spending limit and making it compulsory for each party and candidate to reveal spending at each level, starting from the polling booth, which is what option (e) is saying. However, the author does not suggest following a specific spending limit in election campaigns anywhere in the passage, ruling out (a). Similarly, options (b), (c) and (d) are not mentioned anywhere in the passage. Hence, option (e) is the correct answer. 4. What might happen if the ceiling on anonymous cash donations will be lowered from Rs. 20000 to Rs. 2000? a) It will discourage donors from giving unnamed cash donations. c) It will increase the number of donors up to 10 times. d) It will increase transparency of all transactions which happens in the form of donation. e) It will increase the abuse of law by incumbent parties, and wreck the market for these bonds. According to the fifth sentence of the second paragraph, lowering the ceiling on anonymous cash donations from Rs.20000 to Rs.2000 will not deter donors or parties from giving or accepting unnamed cash donations and the number of donors will simply go up 10 times. Hence, option (c) is correct. 5. Which of these is the "tone of the passage" as expressed by the author? The author initially explains the present norms and budget provisions of political funding proposed by the Government. But right from the beginning the author seems to be against the electoral bonds. He further suggests some other concrete steps to be taken by the Election Commission of India. Throughout the passage the tone of the author is judgmental about the decision of the government. 'Informative' would be incorrect as the author is not merely providing information but also suggesting some measures. The author is not making fun or mockery of the situation for option (b) to be correct. 'Prescriptive' means 'oppressive' or 'tyrannical' which would also not describe the author's tone, making (c) incorrect. An 'analytical' tone is based on facts and takes an objective viewpoint which is not applicable to the given passage, hence is incorrect. Option (d) is the correct answer. Directions (6 – 10): In the given sentences, a part of the sentence is missing. Choose the part/s that can fit the blank both grammatically and contextually. 6. Egypt's armed forces also engaged in sporadic battles with Israeli soldiers ________________ the two countries. I is incorrect as it does not fit in the blank grammatically. Besides, the correct preposition to be used with 'border' should be 'along', in this context. II and III, despite having different meanings, can fit in the blank and make the sentence grammatically correct and meaningful. 7. In order to maintain its credibility as a force in the Balkan region Austria-Hungary needed to enforce its authority _____________ such an insolent crime. In the wake of - Following (someone or something), especially as a consequence. Both I and III can fit in the blank and make the sentence meaningful and grammatically correct. II does not fit in the context, as the part after the blank talks about a crime and not countries/states. 8. Yin and yang, the _____________________principles that make up a harmonious world, ruled the Chinese calendar. I can fit in the blank and make the sentence meaningful and grammatically correct. II is grammatically incorrect as 'principles' will not take the preposition 'at' before it. III will be incorrect as 'clear picture' would not make the sentence coherent in any way. E is the right answer. 9. The study, published in the journal Science, is among the first to model the climate effects of wind and solar installations while ____________how vegetation responds to changes in heat and precipitation. Both II and III have incorrect prepositions as 'how' will not take 'for' or 'at' before it. This makes them unfit to be placed in the blank. Only I can fit in the blank and make the sentence meaningful and grammatically correct. 'To take into account' means to consider or regard something. B is the right answer. 10. India will not _______________along the Line of Actual Control with China, while maintaining border peace in sync with the "Wuhan" spirit, Defence Minister Nirmala Sitharaman has said. The sentence talks about the situation at the border between India and China. It is clear that neither I nor III can make the sentence coherent. Heighten the part- does not make any sense. 'Crack the rib' implies a rib fracture. In the given context, only II can fit the blank and make the sentence meaningful.